I used to think that miso was solely used for miso soups. And I never really bothered knowing all different types of miso- until I had a delectable encounter with a miso glazed fish once upon a time. Then I started looking it up and tried different recipes including my own version of the miso glazed fish. Miso is a naturally fermented paste of soybeans, salt and other spices, sometimes with rice or barley or some other starch. The color and texture would largely depend on the ingredients that goes into the mix. But basically, from experience, I have learned that the lighter the color of the miso (light yellow to almost white), the sweeter it is, and the darker it is (more aged, sometimes brown/ reddish) the saltier and bolder the taste. 1. Miso tends to bring out a lot of liquids (from your fish/meat) when cooked. You might be tapping on a dry paste, but when it comes out of the oven, you see a lot of liquids. This is natural and don't worry. What I do is I bake my piece uncovered for the latter half. Or sometimes, you can also scoop your meat out to a serving dish and let the sauce simmer for a few more minutes until most liquid evaporates then pour over. 2. Miso is already naturally salty. Go easy on the salt. When working with miso, I usually skip the salt. 1. Mix together soy sauce, hot water, miso paste and sugar. 2. 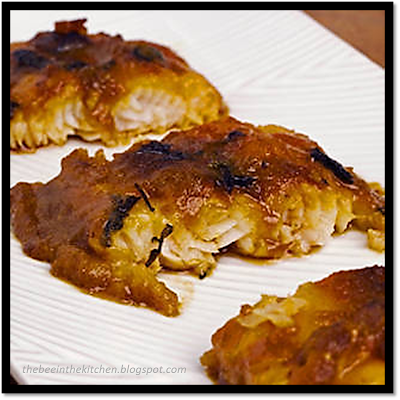 Marinate fish with miso paste sauce for 2-4 hours. Make sure fish is not frozen when marinating, as you do not want the excess water when the fish thaws. Best to marinate the fish when it’s at room temp and pat dry with a towel before covering with your marinade sauce. 3. Broil uncovered on high heat for 10-15minutes. Fish should be tender when done. Garnish with nori strips and sesame oil before serving.